2018 has seen the beginning of a new anti-drug movement, one that is calling out substance abuse, with rappers such as Lil Pump and Smokepurpp announcing they are giving up Xanax this year. After contemplating the idea to change his name, California artist Lil Xan has decided to officially change his artist moniker to his government name, Diego. 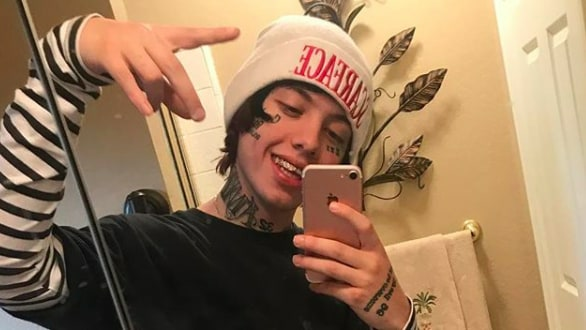 During an initial conversation with TMZ, Lil Xan explained that he had been thinking about changing his name despite previously using the Xanax-inspired moniker as a way to start a dialogue about combating addiction, something the young rapper has battled with in the past. However, during an appearance on Big Boy's radio show, the topic came up once again, with Lil Xan confirming he's now going by his real name, Diego. "It's crazy because I just did TRL in New York," he says. "I left the building and they were calling me Diego. Not one person called me Lil Xan. All my fans were calling me Diego." He then turns to the camera and says, "Yo, it's official, my name is now Diego." The 21-year-old rapper has previously talked about his namesake, noting that his experience with music and combating addiction alike is all part of the journey. "The whole thing is like a journey. It's not like, 'Oh, Xan made a song a long time ago embracing Xanax, he's a f—king liar.' They can see my journey unfold," he previously said in an interview discussing the topic. "That many months ago I was going through that and that's how things were up until 'Betrayed.' Now they can see where it started, what happened, and where I am now. I thought maybe I should delete those tracks, but then I was like, 'I should leave them up for that purpose solely.' It's perfect. People can change. Look at my old stuff, I was embracing all of it, and look at how far I came." The rapper's currently readying his debut album, which along with over twenty other projects has been dubbed among the "most anticipated" of 2018. Check out REVOLT TV's full list of music to keep an eye out for in the year ahead here.